It was a beautiful day for baseball, with the temperature in the mid-60s. Sunshine would have made it perfect, but despite the clouds and overcast, a great crowd of 52,168 showed up at Tiger Stadium on the afternoon of Friday, October 5, 1984, for Game Three of the American League Championship Series. Fans in Detroit did not care that the local economy had tanked and many people were out of work. They didn’t care that the NHL’s Red Wings still seemed like the Dead Things, the NBA’s Pistons were not yet the Bad Boys, or that the NFL’s Lions were following their usual un-lion-like pattern. The Tigers had started the season with a roar, going 35-5, and led the division from wire to wire, the first team to do so since the 1955 Brooklyn Dodgers. The Tigers had won 104 regular-season games, the most in the team’s history. They were a tonic for a town that badly needed one, a reason for people in Detroit to feel good. For the most part, no one was too concerned that the Major League Umpires Association had gone on strike before the start of the postseason, forcing the American League to use a substitute crew for this ALCS. Detroit was a union town, and probably more fans than not supported the umpires — as long as the crew working the game got it right. Retired umpire Bill Deegan had worked home plate for the first two games and would again today, while his two most experienced assistants would again be at first and second base (Jon Bible and Randy Christal, respectively). Different fill-in umpires, none of whom had worked the previous games in the series, were assigned to the umpiring positions at third and the outfield. Detroit had won the first two games of the Series in Kansas City. The first contest, on Tuesday, was a comfortable 8-1 win, pitched by Jack Morris and Willie Hernandez. The next night had been more of a nail-biter. Dan Petry held the Royals to two runs through seven innings, but Hernandez gave up a run in the eighth that tied the game (it was only his second blown save of 1984; he had gone 32-33 in save situations in his Cy Young and MVP award-winning season). Aurelio Lopez kept the Royals scoreless through three more innings, and the Tigers scored two runs courtesy of a Johnny Grubb double in the top of the 11th to win 5-3. The Tigers’ pitching staff could not boast any 20-game winners, but five pitchers had won at least 10 regular-season games: Morris (19), Petry (18), Milt Wilcox (a career-high 17), Juan Berenguer (11), and Lopez (10). The bullpen was about as good as it got with Lopez (who also saved 14) and Hernandez. The pitching staff had an ERA of 3.49 and a WHIP (walks and hits per inning pitched) of 1.262, which were both the lowest in the American League. Their pitchers had given up fewer hits and fewer runs than another other team in the league, and topped the circuit in saves. During the regular season the Tigers had scored 829 runs and allowed their opponents only 643 runs — the first team to lead the AL in both categories since the 1971 Baltimore Orioles. In addition, Detroit hit 187 home runs, the most in all of baseball. It was a balanced attack: No one had driven in 100 runs (Lance Parrish drove in 98, Kirk Gibson 91); and no one had scored 100 runs. Only one player, Alan Trammell, had hit over .300 (he hit .314), but five other players (with at least 300 at-bats) had hit .280 or better. Eight players had hit at least 12 home runs. The Tigers’ batting average was only fourth best in the league, but they led the league in on-base percentage and were second in slugging. They were second in the league in walks, too, and led in the league in intentional walks. Every player except backup catcher Dwight Lowry and utilityman Mike Laga had stolen at least one base, including 35-year-old Johnny Grubb and 37-year-old Darrell Evans (Kirk Gibson led the team with 29). But now it was October baseball, and regular-season numbers didn’t matter. Still, the Tigers could hit and score runs, and that’s what the fans had come to see. Before the game was over, Detroit would manage only three hits, as would the Royals. But it was Wilcox, the 34-year-old Hawaiian-born right-hander, who would win the game that gave the Tigers the pennant. He’d won 17 of the 33 regular-season games he’d started and lost only eight, finishing with an ERA of 4.00. He’d gone 9-2 since July 19. Opposing Wilcox for Kansas City was Charlie Leibrandt, who sported an 11-7 record in his 23 regular-season starts, with a 3.63 ERA. The game’s lone run came in the bottom of the second inning. Detroit’s Barbaro Garbey beat out a single on a groundball to second baseman Frank White. Chet Lemon then hit one to third baseman George Brett, who threw to White to force Garbey. Evans, the 16-year veteran seeking his first World Series appearance, singled to center, with Lemon taking third. Next up was Marty Castillo. At age 27, and with only 201 career games in the majors under his belt, Castillo mostly rode the pine for manager Sparky Anderson in 1984. The California native could catch or play third base, and had a cannon for an arm. But he batted only .234 during the regular season, and was known more for his practical jokes than for his ability to hit a baseball. With a runner on third and one out, Castillo hit a groundball to Onix Concepcion at short, who scooped it up and threw to White at second for the force. White gunned the ball down to Steve Balboni, the first baseman, for what would have been an inning-ending double play. But Castillo, who wasn’t blessed with great foot speed, chugged it down the line and beat the relay. Lemon scored, and the Tigers had an early lead. Lou Whitaker came to the plate next, and on a 2-and-1 pitch, Castillo stole second, and then advanced to third on catcher Don Slaught’s throwing error. Whitaker attempted to bunt Castillo home, but grounded out, first baseman to the pitcher. That was all the scoring in the game. Leibrandt was strong, but Wilcox was better, throwing eight innings while giving up only two hits and two walks, to go with eight strikeouts. Hernandez picked up the save. The Tigers were going to the World Series for the first time since 1968. The game was a vindication for Detroit. All season long, the players had had to deal with the pressures and expectations that went with a 35-5 start. What if they were to collapse in the end? The critics and naysayers ignored the fact that every other team had the opportunity to get off to a comparable start. But all season long, the Tigers played consistent baseball, winning 104 regular-season games. 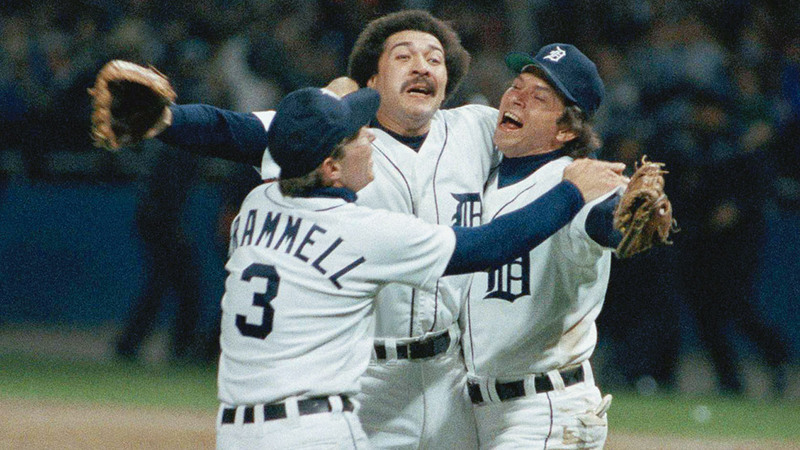 It was a red-letter day for Castillo, who appeared in only 70 games for the 1984 Tigers, but is remembered for his clutch postseason production. Not only did he knock in the winning run in this pennant-clinching game, he later hit a home run that gave the Tigers a lead they would not relinquish in Game Three of the World Series. Castillo set personal — but modest — highs in almost every major offensive category while serving as a defensive substitute at both catcher (36 games) and third base (33 games). Wilcox showed that he had what it took to help win a pennant — this time, in the American League. 1 Tom Gage, “Anderson Gets His Vindication,” The Sporting News, October 1, 1984: 28. 2 Mark Pattison and Dave Raglin, Detroit Tigers 1984: What a Start, What a Finish! (Phoenix: Society for American Baseball Research, 2012), 166.